Overview - Heavyweights tells the hilarious story of a group of underdog kids who discover their beloved summer camp has been sold to a crazy fitness fanatic (Stiller) who's determined to make their lives miserable. The new owner plans to keep the boys huffing and puffing, but these hungry kids have a plan of their own. They unite to turn the tables, take back their woodsy hideaway and challenge the rival camp to the most outrageous summer games of all. No, fellow film fans, you're not dreaming. Thanks to Disney, we now live in a world where 'HeavyWeights' gets a Blu-ray release -- and honestly, I wouldn't have it any other way. It's a prospect so unlikely and improbable that even co-writer/producer Judd Apatow and star Kenan Thompson seem delightfully bemused, but I refuse to dwell on the inexplicable hows or whys. Instead, I'm focusing on the truly important facts: It's here, it actually exists, and we can now all enjoy Tony Perkis in glorious high definition. Excited? No? You mean, I'm the only one? No matter! A silly, sweet and decidedly politically incorrect kids' flick, the film is home to a unique sense of humor that mixes immature gags, goofy comedy, and a bizarrely extreme performance from Ben Stiller. Admittedly, it's not exactly a classic, but I've always found the movie to be a fun watch as a kid, and oddly, in some ways I think I even enjoyed it more now as an adult. Gerry Garner (Aaron Schwartz) is an overweight eleven year old who is forced to go to a fat camp by his parents. Though displeased by the prospect, it turns out that the facility is run by a kindly couple (Jerry Stiller & Anne Meara) who go out of their way to make the experience as fun as possible (there are go-karts!). Unfortunately, after arriving at the camp, it's revealed that the previous owners have gone bankrupt, and the new buyer, Tony Perkis (Ben Stiller), is an insane fitness nut obsessed with turning the kids' weightloss experience into a profitable infomercial. Forced to go through hell, the kids band together to overthrow their nefarious taskmaster -- but will their wits be enough to stop the psychotic health guru? The overall narrative is nothing to get too excited about, and for the most part, the story follows predictable family movie beats. I don't think anyone is going to be shocked by the ultimate outcome here, but what makes the film so unique isn’t its plotting. No, it's the flick's slightly unusual comedic sensibilities that really make it standout. Sure, there are plenty of juvenile gags, fart jokes, and shots of people getting hit in the groin, but director/co-writer Steven Brill and co-writer Judd Apatow also infuse the script with an occasionally odd sense of humor that has a faint edge to it. While it's never truly inappropriate, the comedy is a little darker than your average Disney fare. The whole film becomes a family friendly take on classic POW flicks (it's the 'Grande Illusion' of children's movies), and the gang's various rebellious antics are quite amusing. The tone is often exaggerated and cartoonish in nature, but there's some bite beneath all the goofiness. Hell, there are even a few notable homages to the likes of 'Platoon,' 'One Flew over the Cuckoo's Nest,' and 'Apocalypse Now.' Laughs are frequently derived from the kids' physical ineptitude, but thankfully the weight related humor is never too mean-spirited. Instead, we're always on their side. In a silly reversal, there are actually a few skinny jokes targeted at more slender characters as well. This is an underdog affair through and through, and when the gang finally rises above adversity, it's made all the more satisfying thanks to the many challenges they had to go through. The ensemble of kid actors (which includes Kenan Thompson and Shaun Weiss) are all great. While not all of the child characters get much development, the majority of the roles have fairly distinct personalities and the actors are all natural and funny, avoiding the common affected quality found in many kid performances. The amusingly eclectic supporting cast of adults is also impressive. Beyond the likeable Tom McGowan as friendly camp counselor Pat Finely, we get appearances by the likes of Tim Blake Nelson, Jeffrey Tambor ("Hey Now! "), the aforementioned Jerry Stiller & Anne Meara, Allen Covert, 'Battleship' director Peter Berg, and even Paul Feig (creator of the criminally short lived 'Freaks and Geeks'). Actor Tom Hodges also shows up and is especially memorable as Lars, the domineering counselor from "far away." Together, the odd mixture of talent helps to promote the film above most mediocre children's fare. Of course, the real standout here is Ben Stiller. As the fitness obsessed Tony Perkis, the comedian is essentially playing a prototype version of his character in 'Dodgeball,' and the results are quite funny. Prone to fits of comical intensity, Perkis is distressingly passionate about healthy living and his bursts of motivational insanity are the highlights of the film. Whether he's handing out overly enthusiastic high-fives, curling a bicycle, practicing t'ai chi, psychotically walking over broken glass, or branding the unhealthy children "destroyers," Stiller is clearly giving it his all. In fact, the actor apparently went method with the role, so much so that the kids were told to avoid talking to him in between takes. While the comedian has been responsible for several memorable characters over the years, as silly as it might sound, I actually think Tony Perkis is among his funniest creations. Though the weight related humor might prove a little offensive to some, the film ultimately has a positive message and the filmmakers avoid cheesy, overbearing sappiness. The concept of personal responsibility is celebrated, and the kids eventually learn that when it's not forced down their throats, exercise and healthy living are definitely good things. The rousing, cliched climax -- which features a relay race against a rival camp -- hits all the right tried-and-true beats, and while it's all definitely predictable it manages to play well toward its children audience. Despite my nostalgic affection, I'll be the first to admit that 'HeavyWeights' is far from a great movie. On the surface, this is a standard kid-targeted effort, but the comedic sensibilities of Brill, Apatow, and Stiller elevate the material, giving it an odd but very welcome edge. Simple, sweet, silly, and juvenile, the film is also genuinely funny, in a dumb, goofy kind of way. Though somewhat forgotten, the movie has actually acquired a cult following, and holds an important place in the creative development of several of its now famous cast and crew. With so many other titles waiting to make their high-def debut, some might debate whether a film like this really deserves a Blu-ray release, but I couldn't be more delighted -- and I'm sure Tony Perkis is running a marathon somewhere in celebration. 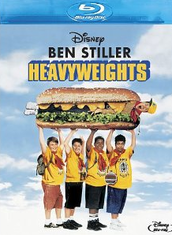 Disney brings 'Heavyweights' to Blu-ray on a BD-50 disc housed in a keepcase. After some skippable trailers, the disc transitions to a standard menu. The packaging indicates that the release is region A, B and C compatible. The movie is provided with a 1080p/AVC MPEG-4 transfer in the 1.85:1 aspect ratio. While the idea of 'Heavyweights' in HD might not seem like the most exciting prospect to most, this transfer offers a rather pleasant surprise. Free of any major issues, the film comes to Blu-ray with a clean, bright image that should more than please fans. Outside of some fleeting specks, the source print is in great condition with no real signs of damage or wear. A very light layer of grain is visible throughout, and while a few scenes can look just a tad noisy, the majority of the picture has a natural, filmic appearance. Clarity is good, and there actually are a few impression scenes scattered about, including a fun 'Apocalypse Now' homage that features a fireworks celebration where the kids gorge on their favorite foods. 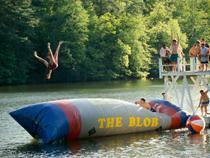 Colors never exactly pop, but the camp scenes are home to bright saturation. Contrast is slightly blown out in a few shots, but the majority of the runtime has even whites and deep, steady black levels with solid shadow delineation and no crush. To be honest, I really wasn't expecting much from the video here (especially considering how inconsistent some of Disney's recent catalog titles have been), but thankfully, the flick looks very nice. It doesn't exactly wow, but as far as I can tell the movie appears exactly like it should. The film is provided with an English DTS-HD MA 5.1 track and a Spanish Dolby Digital 5.1 track. English SDH, Spanish, and French subtitles are also available. The sound design is pretty basic, but the mix suits the material well and offers a few lively kicks here and there. Dialogue is clean and well prioritized, letting all of Stiller's bizarrely intense improvisations come through clearly. Directionality across the front soundstage is good, sending appropriate effects (fireworks, a food wrapper) off to the side when called for. The triumphant score is also handled well, with pleasing separation, fidelity, and even some solid low frequency punch. Surround use is subdued, but music cues and faint ambiance hit the side speakers, and some key scenes feature a few discrete effects as well. The climactic go-kart race is especially fun, as the roaring engines make their way around the room with smooth imaging. Dynamic range isn't as wide as contemporary efforts, but for a mid-nineties kids' flick there really isn't anything to complain about here. 'Heavyweights' won't exactly wow your ears with a mind-bending audio experience, but it certainly gets the job done. Though front-loaded, surrounds do chime in during specific scenes and the slightly exaggerated effects and upbeat music complement the goofy comedy wonderfully. All of the special features appear to be exclusive to this new Blu-ray release, and are detailed in the HD Bonus Content section. As unlikely and inexplicable as it might seem, 'HeavyWeights' is now available on Blu-ray. While far from a classic, the kids' comedy is actually pretty entertaining. An early writing effort from Judd Apatow, the flick features an odd but welcome blend of comedic sensibilities, and coupled with Ben Stiller's hilariously intense performance, the whole affair carries a slight edge. The video and audio are both very solid and feature no serious issues. Supplements are surprisingly plentiful and amusing, especially the commentary with cast and crew. While most are probably baffled that this is getting released at all, for better or worse Disney has really gone the extra mile here, and the movie actually makes its high-def debut in style! For fans of the film, this is the release you've always wanted but thought you'd never get.